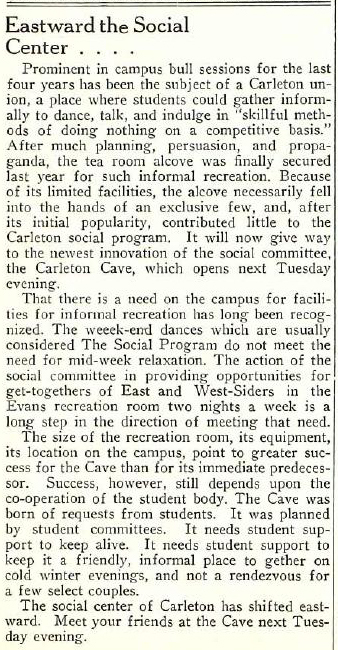 "Eastward the Social Center..." is from the Carletonian, Wednesday, November 20, 1935, and was written by a staff writer. CityPages review of FUZZ, 10/19/2013. Carletonian article about alcohol policy, 9/27/2013, by Hart Hornor. Carletonian article about remodel, 1/25/2013, by Gabe Terrell. Phish at the Cave, 4/11/1991, recording.